Turner, Alison. (2015). UDL Self Reflection [image]. Supporting a child’s individual curiosity is key to creating engaging and meaningful experiences. Stager & Martinez (2013) pose this question regarding what qualifies as a good project: “Who does the project satisfy?” and contend “Great projects benefit the learner more than the teacher” (p. 60). In a recent synthesis of studies K-12 science studies, Minner, Levy & Century (2010) found a clear and positive trend supporting inquiry-based instructional practices and strategies which support active thinking and drawing conclusions from data. Please see an example of integrating Inquiry within my classroom here. Design Thinking for Innovation. If I dig down to my ultimate belief of the purpose of education, Education is to help support learners who can make critically informed decisions for themselves and their community. I also feel learners need opportunities be able to apply their gained knowledge. I hope that by attending to the whole child, through the creation of inclusion in all aspects of learning, I see the formation of a safe environment where children learn to accept everyone, and better yet, have a desire to help others and to appreciate we are all interconnected. When we are able to take this empathetic stance, we can join together to make the world a better place through innovation. Please see examples of Design Thinking used as a tool within my classroom here. “We must remember that intelligence is not enough. Intelligence plus character – that is the goal of true education”. Dr. Martin Luther King. Foster a sense of interconnectedness with others. Art is often created for “an audience”. Thus fostering, what Wolf (1998) calls an exchange & response. Art can often open dialogue between peers, community and home which increases a sharing of perspectives (Greene, 2003; Jensen, 2003; Glass, Meyer & Rose, 2013). Helps a learner create a “product” representing the conceptual structure of knowledge (Alberta Regional Consortia, 2014; Jensen, 2003) as part of UDL and DI learning strategies. Encourages imagination & exploration of ideas through materials (play & purpose). 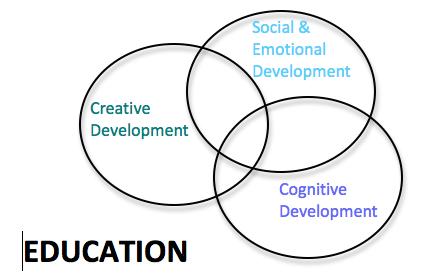 Fosters cross-curricular integration if a learner has access to multiple means of representing their ideas (CAST, 2014) in any subject and fosters increased understanding in other domains (Fiske, 1999). For example, a learner can create a painting to express their feelings and ideas regarding studying the Holocaust in Social Studies (Wolf, 2008). Promotes learner choice (Mason, Steedly & Thorman, 2008; Wolf, 2008). “There are not so many “right” answers as there are multiple, effective, powerful, or stunning ones. Think of all the ways there are to create a portrait […] But to realize a powerful solution or new version means making choices about what to say and how to say it.” (Wolf, 2008, p.7). Inspires a democratic learning environment where students are active participants in personal expression, choice and voice (Mason, Steedly & Thorman, 2008). Glass, Don & Meyer, Anne & Rose, David H. (2013). 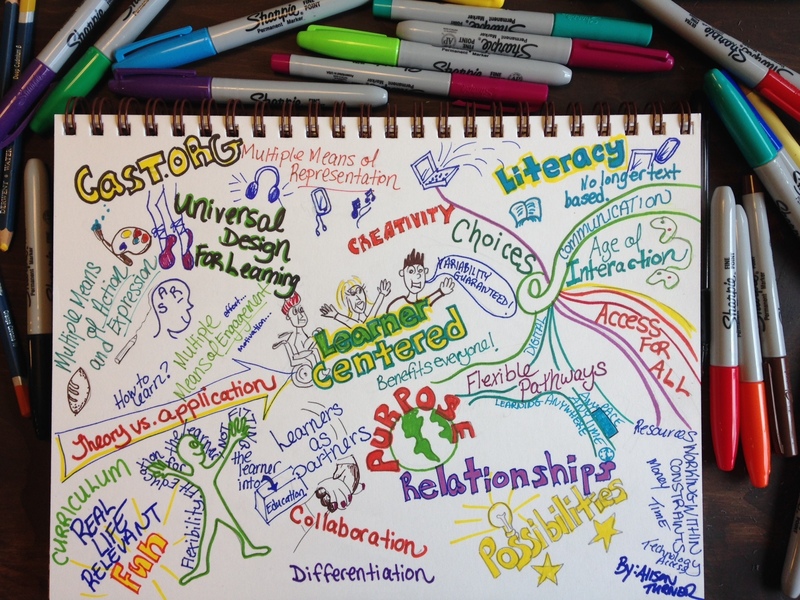 Universal Design for Learning and the Arts. Harvard Educational Review, 83(1), 98-120. Greene, Maxine. (1995). Chapter 2: Imagination, Breakthroughs, and the Unexpected. Releasing the Imagination: Essays on Education, the Arts, and Social Change (pp. 17-31). San Francisco, CA: Jossey-Bass. Jensen, Eric. (2003). Chapter 3: Visual Arts. Arts with the brain in mind (pp. 49-70). Alexandria, VA: Association for Supervision and Curriculum Development. Mason, C. Y., Steedly, K. M., & Thormann, M. S. (2008). Impact of arts integration on voice, choice, and access. Teacher Education and Special Education: The Journal of the Teacher Education Division of the Council for Exceptional Children, 31(1), 36-46. Minner, D. D., Levy, A. J., & Century, J. (2010). Inquiry‐based science instruction—what is it and does it matter? Results from a research synthesis years 1984 to 2002. Journal of research in science teaching, 47(4), 474-496. Sapon-Shevin, M. (2007). Widening the circle: The power of inclusive classrooms. Beacon Press. Tomlinson, Carol Ann & McTighe, Jay. (2006). Integrating Differentiated Instruction & Understanding by Design. Alexandria, Virginia: ASCD.